How will you choose the best patio door style for your home? In Brampton, ON, where the winters are fierce and the summers are unbeatably beautiful—you need a tough door that’s stunning enough to complement our views. Enter: Brock Doors and Windows in Brampton. Our team specializes in patio doors specifically designed to withstand Canada’s unique climate while providing the perfect backdrop to your outdoor space. Further, we understand the important aesthetic impact Brampton homeowners look for in any significant feature for their space. Homeowners want to know their options before diving into a replacement or new construction project, right? 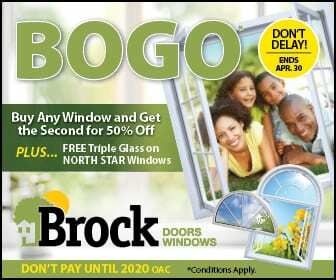 Below, check out two of our premier Brampton, ON patio door lines and the options you have when you choose Brock! Energy efficient glass that has been proven to be 63% greater than regular clear glass at keeping the indoor and outdoor temps from affecting each other. So, which will you choose to add beauty and sophistication to your home? You really can’t go wrong—both are extraordinary. We’d be delighted to show you both options at our showroom so you can choose the best style for your home. The professionals at Brock Doors and Windows look forward to helping you choose one of our gorgeous, tough-enough-for-Canadian-winters patio doors. See you soon!